Trump Plans To Name Michael Flynn As National Security Adviser : Parallels The retired general was one of the first ex-military officers to back Donald Trump. His brazen comments and partisan political work trouble some of his former colleagues. Retired Army Lt. Gen. Michael Flynn spoke at the Republican National Convention in Cleveland in August in support of Donald Trump. 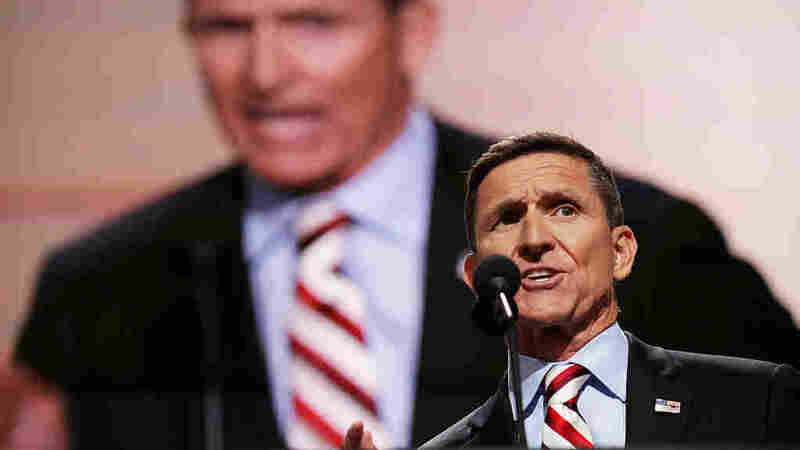 Michael Flynn, Donald Trump's planned choice for National Security Adviser, is perhaps best known to the American public for his fiery speech at the Republican National Convention in the summer, when he spoke to chants of "lock her up," a reference to Democratic presidential nominee Hillary Clinton — and joined in himself. It was a strange position for someone who was a career military officer and a registered Democrat from Rhode Island. Within military circles, Flynn was a highly respected — though at times controversial — career intelligence officer. He worked his way up the ranks, including stints as the top intelligence officer for the Joint Chiefs of Staff, and as Gen. Stanley McChrystal's top aide in Afghanistan. Flynn was never shy about ruffling feathers. In 2010, while serving in Afghanistan, he aired his complaints in a report called "Fixing Intel: A Blueprint for Making Intelligence Relevant in Afghanistan" for the Center for a New American Security, a Washington think tank. Flynn wrote that the intelligence community was not helping in the war effort. Its analysts were not providing the kind of intelligence necessary in the counterinsurgency fight, Flynn said, and the U.S. intelligence community "is only marginally relevant to the overall strategy." It was the most popular report the think tank ever produced. The CIA and others provided detailed information about the enemy, Flynn wrote, but not the kind of political, economic and cultural information he felt was needed about the Afghan people. The defense secretary at the time, Robert Gates, called Flynn's comments a "candid self-assessment," but other officials were seething that Flynn went public with his views. Flynn, by then a three-star general, went on to run the Defense Intelligence Agency, the Pentagon's military-centered spy service. But the workforce there complained he was trying to push through too many changes, including sending more employees overseas. Flynn argued that he was trying to get the bureaucracy to be more efficient, to do more. Critics said he couldn't run a large bureaucracy. He was forced out in 2014 after less than two years in the job. As a civilian, he became one of the first former senior military officials to back Donald Trump. His brazen comments included calling President Obama "a liar." That, along with his partisan political work, troubled some former colleagues and superiors, like former Joint Chiefs Chairman Adm. Mike Mullen. Mullen and other former top commanders, including retired Joint Chiefs Chairman Gen. Martin Dempsey, have urged the military's senior-most generals and admirals to try to keep themselves apolitical. NPR Morning Edition host Steve Inskeep interviewed Flynn back in August shortly after he published a book, The Field of Fight: How We Can Win the Global War Against Radical Islam and Its Allies. "Those countries include, certainly, Russia, North Korea, Iran, Venezuela, countries like Cuba, certainly China. And their national security [strategies], if you will; how they view the world... And what I've seen in the last couple of administrations is just a real failure to truly connect strategic dots around the world." Flynn's sharp criticisms of Russia and its president, Vladimir Putin, don't necessarily jibe with those of Trump, who has praised Putin as a strong leader. While Flynn sees Russia as an enemy, he says the U.S. must work with Putin on some issues — like Syria. "We have to work constructively with Russia," Flynn told the German magazine Der Spiegel last year. "Whether we like it or not, Russia made a decision to be there [in Syria] and to act militarily. They are there, and this has dramatically changed the dynamic. So you can't say Russia is bad, they have to go home. It's not going to happen. Get real." Flynn also says the U.S. must do more to defeat the Islamic State, including persuading Arab states to send in ground troops and dealing with the extremist threat in their own countries. "The sad fact is that we have to put troops on the ground. We won't succeed against this enemy with air strikes alone. But a military solution is not the end all, be all. The overall strategy must be to take away Islamic State's territory, then bring security and stability to facilitate the return of the refugees. This won't be possible quickly." But in his August interview with NPR, he said he did not favor sending U.S. troops into Raqqa. "We should never let our enemies — this particular enemy — rest, have one night's rest. And so if that means using tools, every tool that we have to ensure that this enemy is on the run all the time. This Raqqa is their headquarters in Syria. So we need to consider and we need to use every tool we need to use every single tool that the president of the United States, that the commander in chief can bring to bear and that includes using and working with the Arab nations around that region."